Not all of those books promote quack treatments. Gee, a book that says it’s good to get a disease with a 1/1000 chance of death. A chance of a slow, agonizing death through SSPE. Let’s defend that because it isn’t a treatment book, shall we? Anti-vaccine activist and science illiterate blowhard JB Handley attacks vaccines and also promotes junk medicine. Suzane Humphries–another anti-vaccine activist with bad information. Sure, let’s defend that because it isn’t junk medical treatments. A bunch of autism parents who lost focus and followed the anti-vaccine movement. Sure, it’s not junk medicine. It’s just junk. Wow. What a series of books to defend. I heard someone who has read quite a few of those, ahem, literary works. I had casually mentioned that NYC was ordering people who live within certain zip codes within the city to get vaccinated, due to the measles outbreak. I honestly thought she was going to take a swing at me, which would’ve been a very serious thing, as we were on a military installation. It seems, she blames her daughter’s Crohn’s disease on the HPV vaccine, because of reasons. She then went on how manufacturers put “chemicals” into vaccines that are documented, despite my being able to download the precise ingredient list for any drug or vaccine that is used in the US. She then countered that doctor won’t allow a patient to read the package insert, which is odd, as every physician I’ve ever treat me presented the package insert upon request. So violent was her outburst, a former infantry officer quickly moved about 8 feet away and marveled at my calm responses. And my quiet mention of still having nightmares from our emergency response during a simultaneous regional outbreak of measles and polio, with far too many tiny graves being filled. Oh, she also wanted the old vaccines back, because improved, safer vaccines are a bad thing. Giving patients polio from a deficiently treated culture is a good thing, or something. Of course, she’s also one that embraced the military training “stress card”, which rumors of such began 30+ years ago, when we altered our training procedures to increment stressors more slowly, to allow time to train in stress management in military trainees. That had the odd side effect of having less fighting in the barracks, less mental breakdowns, lower suicide attempts and an increase in quality of graduates of said training. Oddly, one young reservist, of the very generation we altered our training programs for, was sagely agreeing with what she was blathering and confirming the mythical stress cards, proclaiming them to be a new thing (they’re not), but later admitting to never seeing one and that they likely don’t exist (they don’t). Just blindly repeating a rumor that began back when he first joined the US Army. He’ll be shocked when he completes his second phase of NCO leadership training, as that program change is covered in what was once called ANCOC. Which is a part of an advanced training curriculum created during the Vietnam War, as there weren’t enough NCO’s available to lead replacement forces and was derided as “Shake and bake NCO’s”. But, which oddly, was phenomenally effective and some of those who derided the program not only embraced the program, they attended it voluntarily. 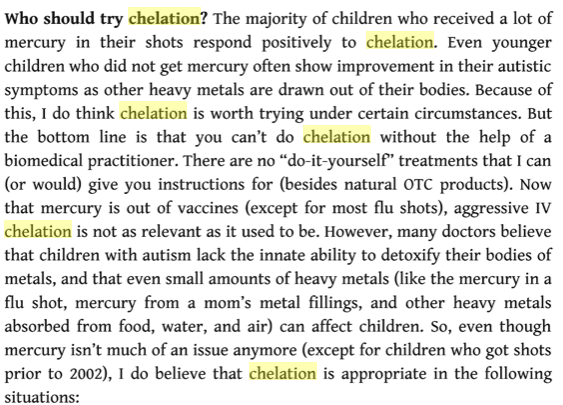 I highly recommend chelation for anyone who has heavy metal toxicity, per lab results, not some BS opinion of a quack stealing your money via willful malpractice. I highly recommend hyperbaric chamber treatment for those suffering from decompression sickness. Might espouse a willful, out of a controlled study group, group of patients for hyperbaric treatment for burns, frankly, I’m beyond dubious. But, that at least, is a field of study. What do I and our intrepid host require is peer review and quantifiable results. What quacks and idiots want are a cure for my brown eyes, seeking some other color of brown. That’s literally what is going on, a trainload of con games, promising a cure for, well, in my case, dyslexia. There isn’t one, we’re part of the spectrum of normal human wiring, my dyslexia actually allows me to understand a word salad from some high functioning autistic people and see through damned good camouflage jobs. I see things differently and conceive them differently as well, that isn’t a taint or problem, it’s a gift that has literally saved lives in time of war. Yes. These are legitimate treatments – when use appropriately. Misusing them turns them into abuse and harm. Yeah–I remember when chelation was sort of big. Parents were advised to *not* go to medical toxicologists. Because, you know, the tests they give aren’t accurate (since all kids are mercury poisoned, tests that say no are obviously wrong). Instead one was supposed to do hair testing. And not look for the heavy metals, but look instead for other elements and count them. Funny thing was that pretty much any result meant “you need to chelate”.